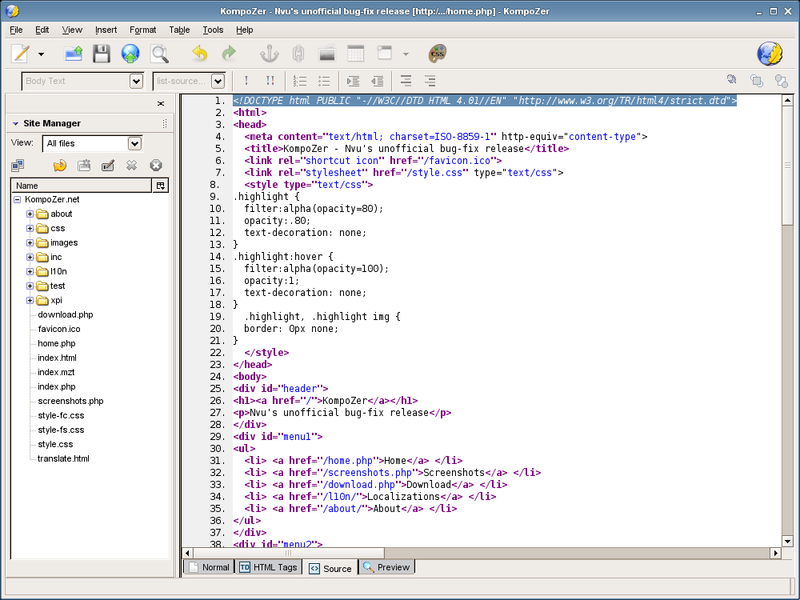 Kompozer – Free and Easy Web Authoring! 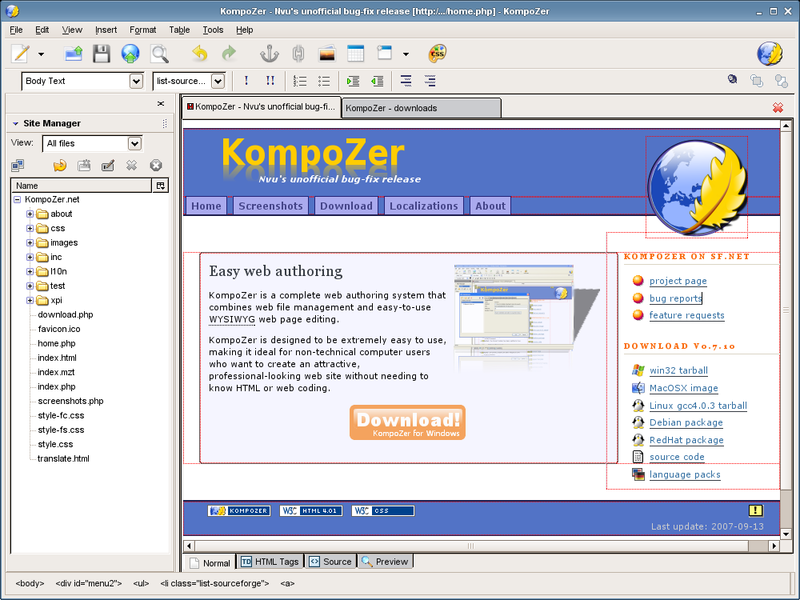 KompoZer is are free, open source solutions, and are community supported Web Authoring System for Linux Desktop, Microsoft Windows and Macintosh users to rival programs like FrontPage and Dreamweaver. Nvu (pronounced N-view, for a "new view") makes managing a web site a snap. 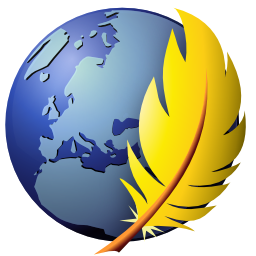 Now anyone can create web pages and manage a website with no technical expertise or knowledge of HTML. Even though its not a newest or the best version of the Nvu software, but it does fix some of the major annoyances in Nvu 1.0. If you have use NVU 1.0 and it works for you, stick with it. But if you run into problems, give KompoZer a try and see if it helps. It's a top-notch WYSIWYG web page program! There's no need to pay a little fortune for a program to create and edit great-looking web pages, including powerful and easy to use CSS capabilities. WYSIWYG editing of pages, making web creation as easy as typing a letter with our word processor. Integrated file management via FTP. We can simply login to our web site and navigate through our files, editing web pages on the fly, directly from our site. FTP site manager - With KompoZer, all the sites you have specified in your Publishing Settings become browseable in a sidebar. You can get a tree view of a site, la Explorer's folders pane, or a one-dir-only view, la Explorer's directory view. 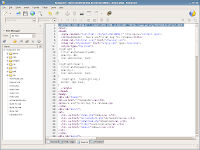 It is also possible to filter files and show all files, or only HTML documents or image files. 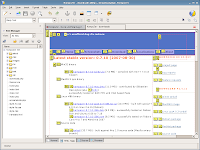 The browsing area also allows to show for each file its size and the date of last modification. A new color picker - KompoZer has a new extended colorpicker, more conformant to what most users are used to. Set a color from its red blue and green components, or its hue saturation and brightness. Or just use your mouse to pick up the color you want. Tabs! 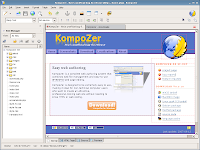 - One of Mozilla Firefox's killer features is now available in KompoZer! Have one window only on your screen and edit several documents at once, each document having its own Undo/Redo stack! Just glance at the tabs to know if a document needs to be saved or not! 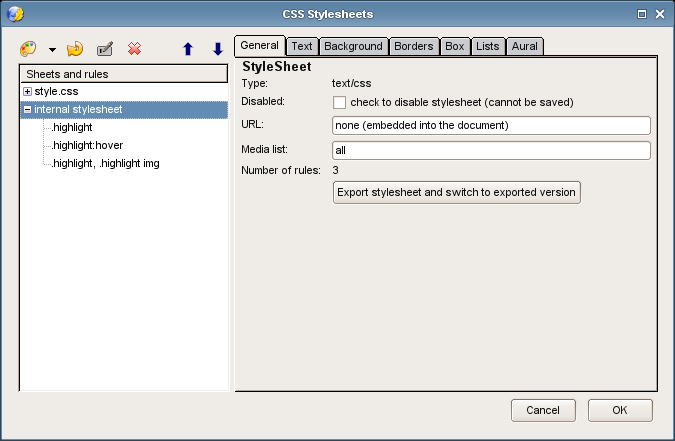 CSS editor - Create stylesheets easily and manage the styles attached to your documents. You can see your style settings applied '"live" to the document you're editing. A dash of style(s) - With KompoZer, right-click on any element in the hierarchical toolbar at the bottom of the window and set directly its style properties. Customizable toolbars - Just customize your toolbar and show only the buttons you want/need. Forms - Take advantage from a XUL-based UI to edit all your forms, and edit all your form elements. 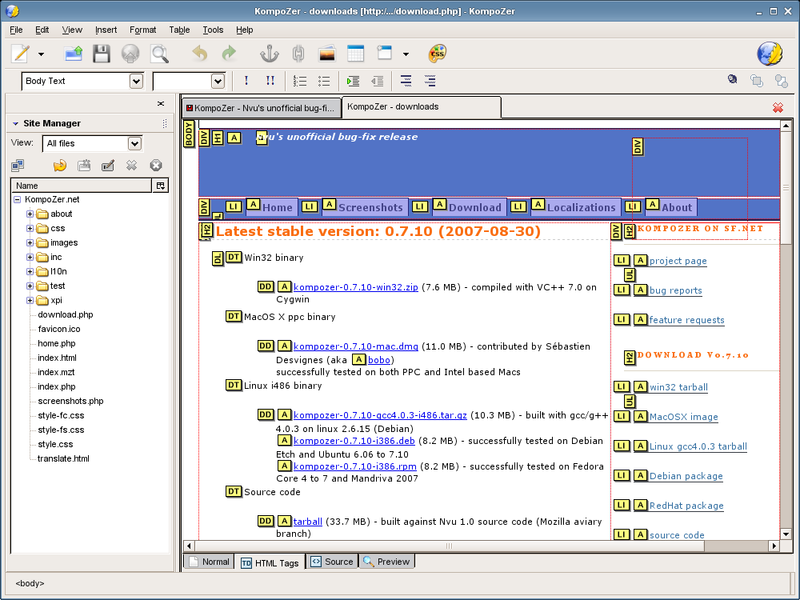 Cleaner markup - KompoZer contains some machinery to get rid of most of those annoying <br>. Combined with the ability to call W3C's HTML validator from within KompoZer you'll make valid, clean documents. XFN - When you create a new link to an external resource, or when you edit an existing link, you can now add XHTML Friends Network information to say that the owner of that resource is someone you know and trust. Visible marks - In a complex page layout, you often need to see visible carriage returns and block borders. KompoZer can now do that for you. And of course, everything is controlled by a CSS stylesheet so you can customize those marks and replace them by your own. Table/Cell resizing rulers - On the left and top side of the opened tab you will find the convenient table resizing rulers which will help you easily adjust the size of rows and columns in any table in the web page you design. Automated Spellchecker - The integrated in-line spellchecker will underline all misspelled words as you type to ensure correct spelling throughout the entire web page. Founded in December 2006, 000webhost.com has a trusted free hosting members base of over 60,000 members and still counting! Offering professional quality hosting, support, uptime and reliability, they have a great community of webmasters, you'd love to be a part of! This is the Congressman Steve Cohen we need, as individuals, families, a district, and a nation.